I joined the Territorial Army in April 1939, being passed A1 medically despite my eyesight which meant I had to wear glasses. I was sent to France as a private in the RAMC in November 1939, just before my nineteenth birthday, and evacuated from Dunkirk in the destroyer HMS Worcester on 1 June 1940. I was then sent for officer training, and commissioned a Second Lieutenant in the Queen’s Own Royal West Kent Regiment in December 1940. Over the next three and a half years a variety of staff jobs in the UK and promotion to captain came my way. Then out of the blue at the end of April 1944 I received a notification from the Military Secretary’s department that T/Capt P. R. Goddin RWK was to report forthwith as Staff Captain to 151 Infantry Brigade. The Brigade was under canvas in a camp in Nightingale Woods outside Southampton and was due to land on GOLD beach on D-Day. I found that my predecessor had succumbed to nervous exhaustion and had been hospitalised three days previously. In the six weeks prior to D-Day I wondered at times if I too would succumb. To me, D-Day was an enormous relief and I was told it showed too. My brigade was due to cross the Channel in LCIs (Infantry Landing Craft), which could carry 240 men, most of whom just sat on the deck – not exactly luxurious accommodation. Brigade HQ staff were spread across a number of such landing craft as a wise precautionary measure. We received orders to embark on our landing craft on Saturday morning, 3 June. The intention was to sail that evening. Various dignitaries came to wish us ‘bon voyage’, some no doubt thinking ‘rather them than us’! We were provided with excellent pre-packed rations, which included pure white bread, something we hadn’t seen for years (the white flower had been especially shipped from Canada). Then reports of adverse weather led to the postponement of the landings for 24 hours, but the embarked troops were not allowed off their craft. By Sunday morning the three battalions in my brigade were fractionally below their 100 per cent fighting strength as a result of various minor sicknesses. As the Brigade Staff Captain I had to journey to Winchester where the brigade’s first line reinforcements were being held. I duly arranged for the necessary men to be despatched immediately to their battalions. As it was now Sunday lunchtime, I took the opportunity to have a bite to eat in the nearest restaurant. I found myself wondering what my fellow lunch eaters would have thought if they had known that the solitary battle-dressed captain had come off a landing craft which would that night be on the way as part of the greatest invasion force the world had ever seen. Our LCIs ran us onto GOLD beach with a wet gap between the vessels’ bows and the dry beach. We disembarked down ramps on each side of the bows, so if we were lucky we only got our trouser legs and boots soaking wet. With tapes marking a safe rout, we got off the beach and through a minefield as speedily as possible to an assembly area. There we linked up with our jeeps and Brigade HQ command vehicles, half-tracked American all-purpose carriers. DUKWs were busy ferrying stores ashore, some of them soon to be patients in a drowned DUKW parking area. Brigade HQ lost two officers killed in the landing operation, but we quickly became a cohesive body and off we moved in the direction of our planned D-Day objective, the Caen-Bayeux road. Our CO, Brigadier Senior, was wounded, so for the remainder of D-Day the Brigade Major virtually commanded the brigade. We couldn’t pull in the senior battalion commander, as he was too committed in command of his battalion of the Durham Light Infantry. A new brigadier reached us on D + 4 (Brigadier Watton), but he only lasted a few days before he too was wounded. Our third brigade commander, Brigadier Desmond Gordon, was a 33-year old regular. 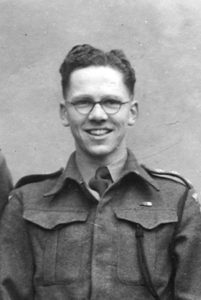 I was his 23-year old Staff Captain, and one time RAMC (TA) private soldier, as the battle for Normandy began in earnest.